Farm Works Software - Precision Ag Equipment - Mind-blowing Training and Support! Farm Works™ Accounting software combines the elements of former Farm Works programs Trac and Funds to easily integrate financial records to get detailed enterprise statements for your fields, equipment or livestock groups. Comparing the cost of production for each enterprise will help you make key decisions to improve profitability of your farm or operation. Accounting software provides an automated inventory tracking process for your supplies, planted crops and harvested crops. It is quick and simple to make and fix accounting entries using the interactive account register to edit your transactions and allows you to maintain a full audit trail. Generate cash reports for taxes. Print market value reports and budgets for bankers and keep accrual reports for your own use. Accounting easily integrates with Farm Works Mapping software (formerly Farm Works Trac, Site and Pro) to give you a comprehensive management solution for your farm or operation. You can enter grain contracts then print out a position statement to keep track of how much grain is left to be contracted. Keep contracts up to date through sales and even print reports to organize grain deliveries. 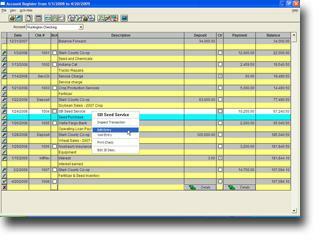 Use an interactive check register with the capability of editing and printing checks and checkbook reconciliation is easy. Attach invoices and receipte to transactions. You can attach scanned copies of invoices, check stubs, etc. or even a long text note to a transaction that can be viewed by clicking on a paperclip button in the account register. Print accounting reports for both cash and accrual general ledgers. Keep up-to-date inventory for supplies (such as seed, chemicals, fertilizer, feed and much more) as well as inventory for harvested crops and livestock. Automatically calculate profitability of each field or group of animals. Enter payroll records and let the system calculate federal, FICA, and most state withholdings. No monthly closings are required and year end is simple. Record animal weights and feedings to calculate feed conversion and cost per pound gained and sold for each livestock group. Create reports to make tax preparation easy with a tax schedule area. Generate market value balance sheets. Easily keep family living costs separate from farm costs. Predefined accounts and financial statement formats are available that can be modified to reduce setup time. You can enter depreciation amounts for equipment, structures, land improvements, and livestock. Includes a wide range of financial reports including VAT, Schedule F, Bank Reconciliation, Enterprise Statement, Income Statement, Balance Sheet, Cash Flows Statement, Trial Balance and more. Import bank statement data to help find accounting mistakes, enter transactions without details, or to reconcile the checkbook. Which Farm Works Software do you need? Microsoft Windows (XP, Vista, Windows 7 and Windows 8) NOTE: Mac is not supported, Sorry!